This Renaissance Outdoor Patio 5-piece Hand-scraped Wood Dining Set is a unique way to display your personal style! Made from 100% Acacia Hardwood that is native to Australia and Asia and used in the construction to make excellent and high quality furniture. Every piece of our Renaissance Outdoor Patio Dining Set is hand scraped that looks like a distressed heirloom piece that will bring your outdoor patio an amazing look. 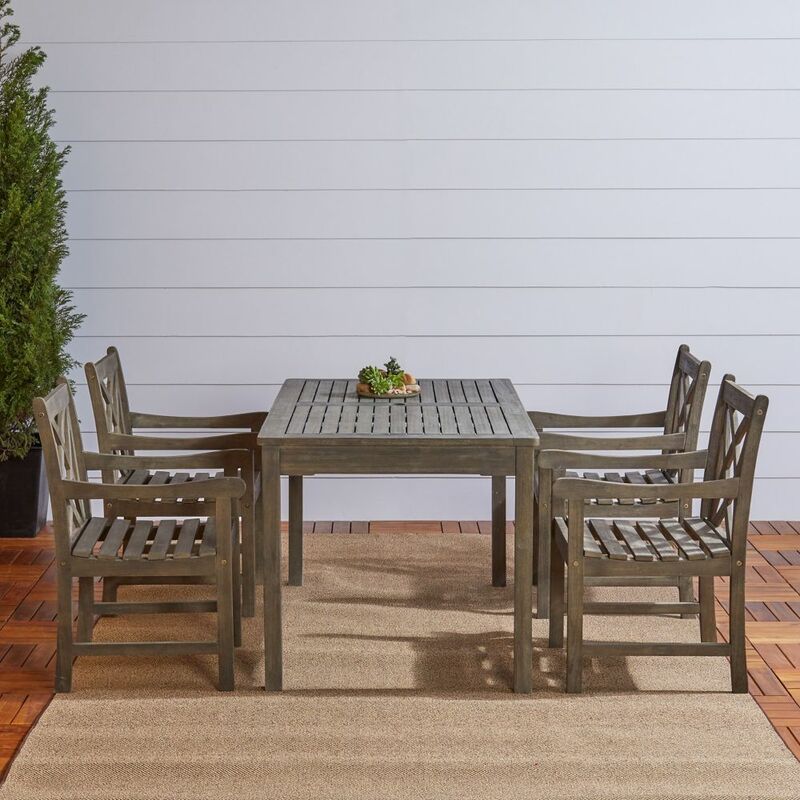 The 5-Piece Franklin Estates Outdoor Patio Dining Set features 4 hand woven wicker chairs and a 48 inch round dining table that has a hole for an umbrella. The table top is made of GRC which is a glass fibre reinforced concrete with a beautiful faux wood finish. This patio set is constructed of steel and hand woven resin wicker. Great for both indoor and outdoor entertaining. Our 7-Piece Tacana Outdoor Patio Dining Set features 6 espresso hand woven wicker club chairs, 6 striped lumbar pillows and a 71 -inch rectangle dining table constructed of durable faux wood with an umbrella hole. This patio set is constructed of powder-coated rust resistant steel and hand woven resin wicker. Great for both indoor and outdoor dining and entertaining. The 9 Piece Indo Rectangular Dining Set features a soft squared back dining chair with thick, comfortable cushions. The wooden, farm style rectangular dining table is the perfect statement piece you've been looking for! Made using weather resistant resin wicker and FSC wood components, this collection works well in any outdoor living space. This collection is available in two different Sunbrella cushion colours and compliments the Indo 4 Piece Lounge Set well. Renaissance 5-Piece Wooden Patio Dining Set in Hand-Scraped Finish This Renaissance Outdoor Patio 5-piece Hand-scraped Wood Dining Set is a unique way to display your personal style! Made from 100% Acacia Hardwood that is native to Australia and Asia and used in the construction to make excellent and high quality furniture. Every piece of our Renaissance Outdoor Patio Dining Set is hand scraped that looks like a distressed heirloom piece that will bring your outdoor patio an amazing look.